Students blow the walls off the classroom. Do you have underrepresented students who are disengaged? How do you get them excited about learning? Watch as we transform learning in the classroom. Score with Technology-Infused Project Based Learning (PBL). 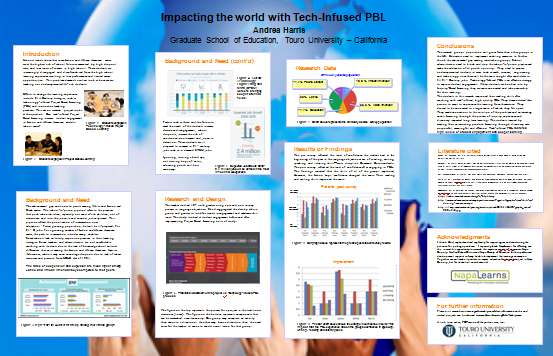 What impact did using technology-infused Project-Based Learning have on student attitudes and confidence about learning? Can implementing Project Based Learning increase student engagement among Latino and African American middle school males in the classroom? The Technological, Pedagogical and Content Knowledge (TPACK) graphic represents how a teacher’s knowledge domains intersect at a sweet spot to impact student engagement. The Contextual TPACK model shows the variables which shape an educator’s technological, pedagogical and content knowledge. Technology-infused Project-Based Learning is an effective strategy in boosting engagement among underrepresented students.